Another Mickey Mantle that has been used and abused. I like to take my baseball cards out of their sleeves and actually touch them. I hate cards that have been graded and encased in that sealed plastic. I really need to be careful with this one. I'm afraid it may fall apart in my hands. Both of these old Ty Cobb cards are trashed. One has a pinhole and severely rounded corners, the other has heavy creases and a chunk missing from a corner. Still, vintage cards of the Georgia Peach. I'm never going to be able to afford the 1952 Topps Mickey Mantle, or the Eddie Mathews, Jackie Robinson or Andy Pafko. I'm not even sure I would want an Andy Pafko. But I do have a Willie Mays. Be it Willie Mays with two giant creases through his face. I actually got this in a trade. Yep, those are burn marks. This vintage Walter Johnson card seems to have been singed at some point on the bottom left corner. It's in pretty bad shape, but it's a Walter Johnson. I remember getting this card about 10 years ago in Van Nuys, Calif. Some guy at a baseball card show was selling it. I'm not sure what I paid for it but if I were to guess I'd say about $100. Today in NM condition it lists for $2,100. If it were only in NM condition. I found this at a card show in Los Angeles about three years ago. It's not trimmed and it doesn't have any major creases but it's for sure a poor card. I recently saw a few of these cards sell on eBay in the $1,500 range. This one is worth no where near that, but it won't be found in the bargain bin either. Check out Lowe's cool 19th-century, tie-up jersey. I wonder who's back pocket this card was kept in? 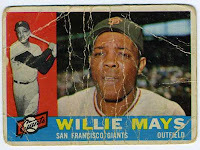 I saw Willie Mays at a local card show about five years ago. He was charging about $200 for his autograph. He was also sitting alone and there was no one in line. Sad. In my book, Willie Mays is second only to Babe Ruth as the game's greatest player. I payed about $12 for this card a few weeks ago. It lists for $100 in NM condition in one of the recent price guides. Did I pay too much? Maybe but I couldn't resist this beauty. I haven't seen too many of these cards over the years. While these early cards are becoming harder and harder to find, getting one in any condition is good enough for me. Dan Brouthers' name is hardly visible on the bottom of the card as is his position and team. Brouthers was a Hall of Fame first baseman for Detroit and would have played barehanded. He was one of the 19th century's superstars. Creases, near paper loss and tape marks, this 1953 Jackie Robinson has a lot going for it (or should I say not going for it). But it's still Jackie Robinson. As a kid, I always wanted a Jackie Robinson baseball card. Today, I've got a few. But no matter what the condition, I always enjoy reading the backs of his cards. Robinson is one of those players every kid should have. He along with Willie Mays, Mickey Mantle, Hank Aaron and Ted Williams are icons of the game. This card wouldn't be so bad if it weren't for the sizable scuff mark in the top left corner. Spahn led the National League with 21 wins in 1957. He also had 111 strikeouts. I remember seeing Spahn in Cooperstown, N.Y., just before he died. He had quite a crowd surrounding him. The 1958 Topps issue is one of my favorites. I really enjoy its simple design, a classic. The bright green color is still vivid even 50 years later. I've collected a bunch of T206 cards over the years but this one is in pretty bad shape. It looks as if someone has run it over with a truck. But I don't care. I'd still rather have it than just about any other card issued after 1980. I wonder how many people have handled this card over the past 99 years? Isn't is great ( I mean poor)? How about those tape marks? I grew up listening to Coleman call San Diego Padres games on the radio. I even remember the year he left the booth in order to guide the team as field manager. 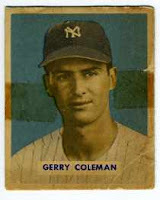 This card is from his rookie season of 1949. Not only was Coleman a teammate of Mickey Mantle on the Yankees in the 1950's, he also served his country as a Marine pilot. He was recently inducted into the National Baseball Hall of Fame as a broadcaster. My favorite thing about this card may be the back. It reads that if you send in 25 cents and five wrappers, you can get a plastic baseball game. I wonder which is worth more today: the plastic ball, the card itself, or one of those old wrappers? It's been some time since I added to my collection via eBay. This week I added several cards including this 1969 Topps Mickey Mantle. I never saw him play (too young) but there is no doubt that he is one of the game's greatest. While this card has seen better days, it's still a Mickey Mantle from his playing days. Well, sort of ... Mantle actually retired before the 1969 season. As far as condition goes, it doesn't make much sense to pay hundreds (if not thousands) for a card in mint condition when this one was just a fraction of the price.